This simple belt is made from high quality vegetable tanned leather. For Cosplay and LARP this is an indispensable and versatile accessory to customize your outfit. This belt is 160 cm long and looks great on both men and women to wear over a tunic or dress and to emphasize the waist for a nice fit. 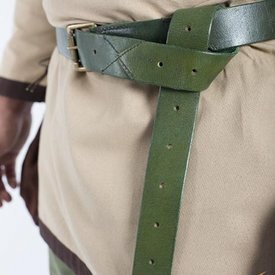 A belt like this is also essential for hanging accessories such as cutlery, a knife, a bag etc.